As we look to next week, we will be honoring Martin Luther King, Jr.’s legacy on Monday. As the most prominent civil rights activist leader in the 1960s, King’s impact is still felt today. However, as this week’s featured title discusses, there is still plenty of work to do around the world in the fight for justice and equality for everyone. 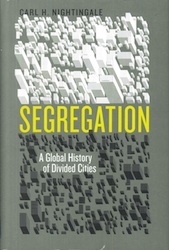 Nightingale, professor at University of Buffalo, State University of New York, examines the roots of segregation, the separation of races, which extends back far beyond the relatively current examples of South African apartheid and the Jim Crow era of the American South. He demonstrates how the idea dates back to approximately 5000 BC in the Mesopotamian era and has carried through to modern times. The author provides in-depth analyses of colonial times in Calcutta’s “White Town” and “Black Town,” as well as Chicago’s more “subtle” segregation. This book is sure to provide plenty of food for thought when it comes to the construction of societies divided by the color line. This entry was posted in new stuff tuesdays and tagged books, diversity, history, new stuff, race, segregation, sociology, urban studies. Bookmark the permalink.